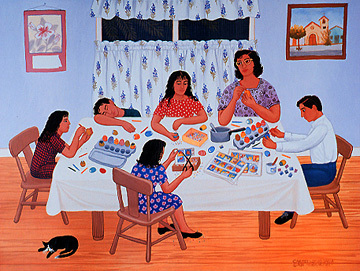 Many cultures have an egg tradition especially around Easter. 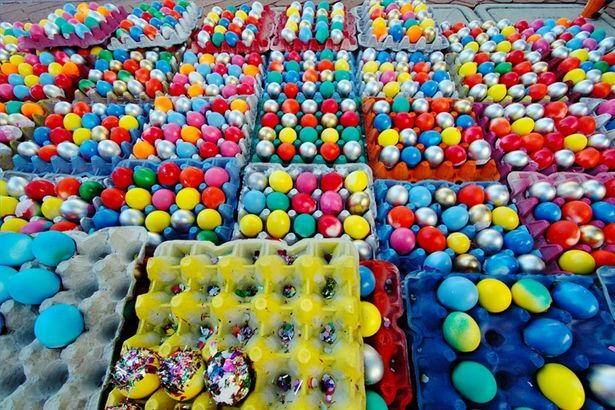 In Mexico it's common to see colored eggs thrown at fiestas during carnaval, just before lent. They're not hard boiled like the eggs in the U.S Easter egg tradition. Instead they're eggs that have been hollowed out and have a surprise filling - called cascarones. Several sources, including CascaronCrazy.com, credit Carlotta, the wife of Emperor Maximilian, for bringing the tradition to Mexico. According to this theory, Carlotta brought the perfume-filled eggs to Mexico in the 1860s while her husband ruled the nation. The eggs caught on, with cheaper confetti replacing the perfume. If your interested in making your own cascarones... I've added some directions below. Have fun!! Tap the end of an egg gently on bowl and peel out a 1/2 ” hole. Let the egg contents flow empty into the bowl. Rinse out the egg with water and let it dry out upside down. Be very careful, the egg is fragile! Once it is dry, you can either use an egg dying kit to color the eggs, or you can paint on your own designs. Carefully fill the egg with confetti and put a thin strip of glue around the edge of the opening. Cut a piece of colored tissue paper that is a little bigger than the size of the hole in the egg, and press it over the opening.